Our Book "Spaces we have known." "Spaces we have known." Out Now! The publication of our first collection of short works titled “Spaces we have known.” is available for purchase on Amazon! A Special thank you to the members of HYPERGRAPHIC Vol. 1 for all of their hard work and dedication throughout this process. “Spaces we have known” Available January 2019! H Y P E R G R A P H I C P R E S S is proud to announce the publication of its first collection of short works titled Spaces We Have Known. Over a period of 8 weeks this past summer our work-shoppers produce an astounding 8 stories per week, each! The pieces in this collection represent the best of the work they have done during the summer program. Richard Wilde Lopez is an author and artist. He, alongside Johnny Taranto, are the creators of Hypergraphic and all its creative layers. Because he needs balance, he is working on both a novel about the Latino family dynamic and a comic about Queer supernatural teens. He often writes about mothers because he finds the concept of motherhood innately complex and fascinating. His characters deal with issues of race, gender identity, shame and the search for happiness. In his non-writing life he can craft a mean cocktail and enjoys cooking for friends and family. He lives in Washington Heights, NYC where he watches city hawks near the Hudson river. Alonso Diaz Rickards is a painter and writer from Mexico. His recent fiction focuses on contemporary urban life, seeking comedy in intergenerational misunderstandings and the minutiae of social media mores. He has written a satirical novel about London’s art world, in which a young Mexican artist lies, steals and hustles his way to success. 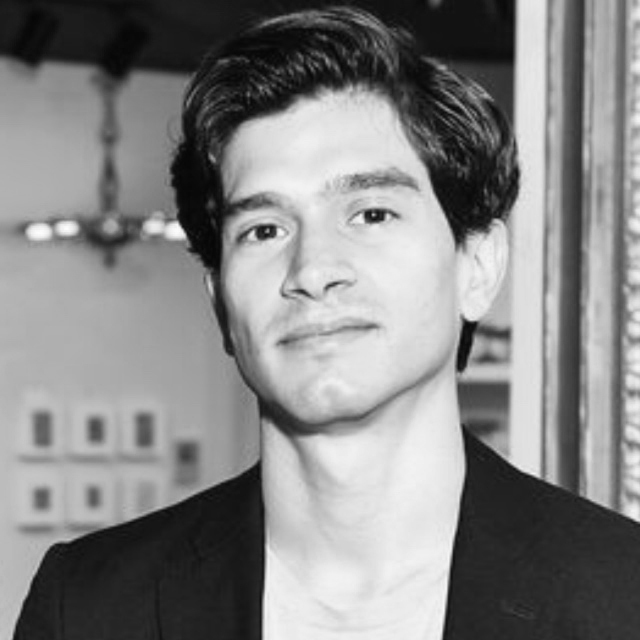 When he is not writing or making art, Alonso teaches figure drawing and enjoys running through Manhattan’s parks. He co-wrote the screenplay for the short film Ex-Voto, which will premiered in New York in Autumn, 2018. Arjeta (Arieta) Palevic has several names, and don’t worry, she finds it confusing as well. Her Starbucks name is Anna, because no one can ever get it right and that’s just exhausting. She is a writer of science fiction & fantasy, a genre that is both restrictive and limitless. She thrives in dualities. Her stories revolve around women and their relationships with those surrounding them (Mostly sisters. Interestingly she has none of her own) and how they navigate these complex worlds and the assumptions they’re raised on. She spends her days working passionately at the Educational Video Center in New York City and is the Photographer for the New York Asian Film Festival. She has studied filmmaking, sociology, and writing, and promises there will inevitably be more to add to this list. Her work has been exhibited at the Rita K. Hillman Gallery at the International Center of Photography and the Dr. M. T. Geoffrey Yeh Art Gallery at St. John’s University. Efe Songun is a Turkish born writer and activist. His writings on queer lifestyle and arts, short fiction have been published by Istanbul Art News, Notos Monthly Literary Journal, Lotus Eater, the Washington Blade and the Daily Beast. He likes words, imagery and stories. In 2015 he founded a mobile curatorial space and arts initiative Harup that combines his passions as a writer. Germ Lynn is a cellist, freelance writer, and professional giver living in Brooklyn, pursuing a life after death by sowing seeds, recording sounds, and doing mostly good things. Published under a deadname, their work is lost or at least, remains to be seen. Germ started in radio, enjoying the sense of urgency and intimacy that could be conveyed with the human voice, even mediated. Things went south with a promotion to the social media department, where “the voice” got too abstract and at the same time, loud. Tired of spending most of their time thinking about social media campaigns, Germ quit a mediocre job and landed an entry level job in an entirely unrelated field. Now they are pitching articles, so still interviewing and pursuing journalistic work, between the demands of being the live-in help. And during the day, they work in an adaptive garden that provides horticultural therapy to people with developmental disabilities and mental illnesses. Much of their work explores finding a voice. Germ leads a quiet life, at times constrained, but surrounds themselves with revolutionary people and things. The garden provides fertile ground to access ideas about death, faith, failure, and renewal and many of these themes come up in Germ’s writing too, as they are interested in finding for themselves permission to speak and freedom to fail. Heather Anne Hudgins is a poet and visual artist. She was born in 1994 in the mountains of Southwest Virginia and currently resides in Brooklyn, New York. In 2018 she released her first book of poetry titled all tomorrow’s parties are happening today through the publishing company Lost Alphabet. She is a Pisces. T.B. Grennan’s short fiction has been published in Construction Literary Magazine, Digital Americana, White Stag Journal, and The Seventh Wave, and his short film “Picking Up” premiered at the 2015 Boston LGBT Film Festival. He was born in Burlington, Vermont, and lives in Sunset Park, Brooklyn. H Y P E R G R A P H I C is looking for Bloggers, Essay Writers, Short Story Writers, Poets, Videographers and the Like! Artist, we want to hear from you. We are a Queer Space for Creative writers and we are hoping to grow our budding community. Now that the end of HYPERGRAPHIC workshop Vol.1 is upon us we asked our workshoppers what, if anything, they wanted more of from this group. There was a clear emphasis on wanting it to be MORE QUEER. So with that we have created a blog platform for creative Queer talent. There is a collective intellectual rage brewing in so many of us. As artists we inform this rage through our creative talents. How do we, as artists and creatives, navigate these spaces of race, cultural identity, feminism, and queer identity within this current socio political landscape? Send us your essays, poems, short stories, hybrid texts etc that challenge, resist, and subvert homophobia, transphobia, racism, xenophobia, fatphobia, misogyny, toxic masculinity, machismo etc., at this political and cultural moment. Send us the beautiful, the sad, the heart felt. Send us the difficult moments and moments of celebration. We want first hand experiences and intimacy, we want fiction and nonfiction. We want high conceptual art. Send us what YOU want to see in a Queer forum. Feel free to get in touch @ hypergraphicnyc@gmail.com. Hypergraphic is proud to announce The LGBT Center of NYC will be hosting the first ever run of our writers workshop! The Center has been an amazing resource for Queer identified folk and their allies since 1983. We are more than grateful and excited to be part of this amazing network and community. Come make some beautiful words with us this summer in this historic New York space! Due to scheduling conflicts and available dates at The Center, we have decided to push back the due date for submissions to Sunday July 8th, 2018 at 11:59pm. The Workshop will begin at the end of July and run through September. As always, please feel free to contact us with any questions, comments, or concerns at hypergraphicnyc@gmail.com.